On Wednesday the 15th of July six Tootsies bundled into our lovely tour bus bright and early. Now, normally we are not women that welcome an early morning… However this morning we were on our way to the NATIONAL VINTAGE AWARDS! Over the last seven years we have seen the vintage industry grow and transition so rapidly, we could hardly contain our excitement on the way to an event celebrating our wonderful community! After a few hours of sing-songs, snacks and chat we arrived at the beautiful Pittville Pump Room in Cheltenham. Built as a spa building in 1740, the decadent venue really could not have been more perfect to host the NTAs! One of the things we love about our job is all the wonderful people we get to work with and this night was packed full of gems… Jonathan D Ellis & Kiki Deville were our vivacious hosts: Hilarious, stylish and slick they kept the evening swinging. 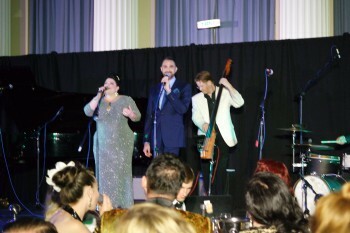 Just when we thought we couldn’t be more impressed by their witty repartee & divine styling they burst into a sassy, jazzy rendition of ‘The Lady is A Tramp’. Well, it was vintage heaven- wrapped in Ozwald Boateng & Vivienne of Holloway! 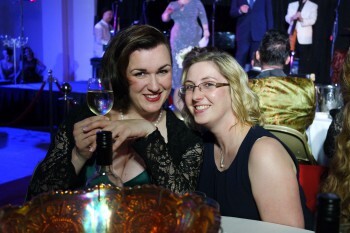 At our table we managed to catch up with our dear friends Rachel Egglestone Evans and Lisa Evans from Vintage Life magazine. We couldn’t help but be struck by how many inspiring women there are leading the way in this industry, not just leading the way but paving the way and encouraging other women too. This is “The Sisterhood” at its best! Now don’t go getting carried away, the night wasn’t all sipping champagne and relaxing. We also did a special guest set at the end of the evening with our incredible band The Dappers… Actually what are we saying? Yes, the night really was all fun and games. The feeling of performing to a group of people as passionate about a cause as you are – you simply cannot beat it! Thank you NTA’s, we can’t wait for next year…! Lilli Moore for her work predominately with The Alzheimer’s Society.